WineBlock is the world's first red wine stain preventing lip and teeth balm. You know, that embarrassing purple hue you can get on your lips and teeth after one glass of red wine? With one swipe of our clear, all-natural and plant based formula, you're protected from that embarrassing purple hue, commonly called "wine mouth." Designed with the help of a taste chemist to never interfere with the taste of your wine. Simply apply, drink and smile. 1 jar contains approximately 30 applications. Wine stain preventing lip & teeth balm. 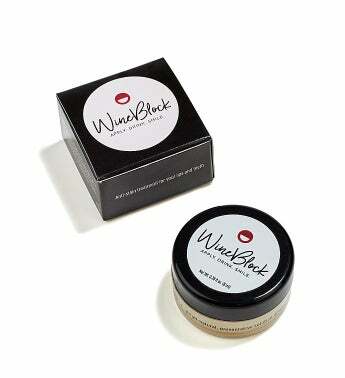 Apply WineBlock before you drink red wine to avoid the dreaded purple hued wine smile.